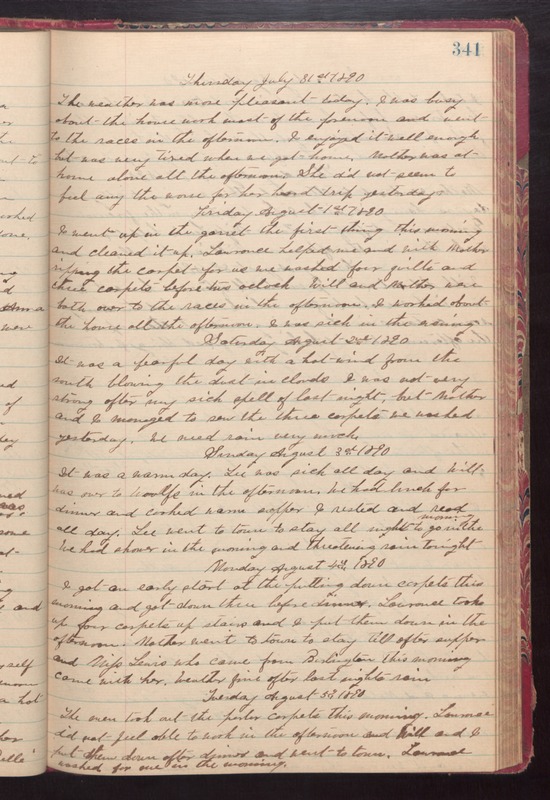 Thursday July 31st 1890 The weather was more pleasant today. I was busy about the house work most of the forenoon and went to the races in the afternoon. I enjoyed it well enough but was very tired when we got home. Mother was at home alone all the afternoon. She did not seem to feel any the worse for her hard trip yesterday. Friday August 1st 1890 I went up in the garret the first thing this morning and cleaned it up. Lawrence helped me abnd qwith Mother ripping the carpet for us we washed four quilts and three carpets before two oclock. Will and Mother were both over to the races in the afternoon. I worked about the house all afternoon. I was sick in the evening. Satuday August 2nd 1890 It was a fearful day with a hot wind from the south blowing the dust in clouds. I was not very strong after my sick spell of last night, but Mother and I managed to sew the three carpets we washed yesterday. We need rain very much. Sunday August 3d 1890 It was a warm day. Lee was sick all day and Will was over to Woolfs in the afternoon. We had lunch for dinner and cooked warm supper. I rested and read all day. Lee went to town to stay all night to go in the morning. We had shower in the morning and threatening rain tonight. Monday August 4th 1890 I got an early start at the putting down carpets this morning and got down three before dinner. Lawrence took up four carpets up stairs and I put them down in the afternoon. Mother went to town to stay till after supper and Miss Lewis who came from Burlington this morning came with her. weather fine after last nights rain. Tuesday August 5th 1890 The men took out the parlor carpets this morning. Lawrence did not feel able to work in the afternoon and Will and I put them down after dinner and went to town. Lawrence washed for me in the morning.